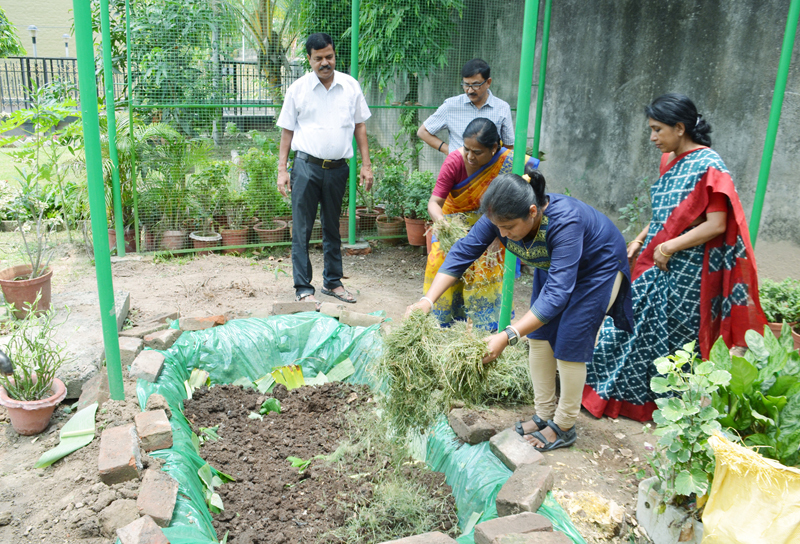 ICAR-CIFRI has taken a initiative to produce vermicompost from the organic waste materials like garden waste, leaf litter, kitchen refuge, weed biomass, etc. using mixture of three earth worms namely, Eudrilus eugeniae (Night crawler), Eisenia fetida (Red earthworm) and Perionyx excavates. Two composting units have been installed- dig bed (Dimension- L x B x H: 4 ft. x 2.5 ft. x 1.5 ft) and concrete erect bed (Dimension - L x B x H: 4 ft. x 1.5 ft. x 0.5 ft). Both the beds were pre-prepared with chopped banana leaves, decomposed cow dung and partially degraded weeds biomass as composting material. Earth worms were inoculated on 31.05.2018 on the occasion of concluding day of Swachh Bharat Pakhwada, 2018. The manure generated from the compost units will be used for nursing the CIFRI Garden.